Just as Arizona is known as the “copper state,” it stands to reason that there should be a copper museum. While North America in itself is the largest copper producer in the world, Arizona sits on top amongst the states in being at the heart of copper production. Most times when one encounters a museum – especially devoted to a natural resource – one would envision displays of pieces of the resource in its natural form, in small and large exhibits. However, this building of unique metal history shows through the Ages what man has done with the metal – “art of the average Joe” is what it could be deemed. Out of the seven primary natural metals, copper was discovered in 9000 B.C. and its first use was in the form of weapons. Going from there, people constructed various items out of copper as well, to include kitchen and shop tools, and architecture. The exhibits reveal copper art and collections for study, which were created by coppersmiths, soldier artists and braziers; many of whom were masters in their trade. 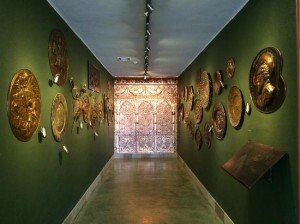 In addition, copper artifacts with an emphasis on American and European works-of-art from the 16th to the 21st century are all on display in this multi-room facility. The Copper Art Museum is a new museum with roots that can be traced back to 1919, where an antique shop was located in Northern Minnesota. In the early 1960’s copper wares were collected throughout Europe and later sold in the U.S.A. at on-the-road shows throughout the Midwest during the 1970’s. The 1980’s – 90’s saw an increase in purchases and sales of copper artifacts from Europe and the U.S.A. In the early 2000’s the collection was so large that plans of a museum came to life and a location was sought. Later Clarkdale, Arizona was chosen as the site for a museum of copper art showcasing Arizona’s most precious treasure. Posted on July 29, 2014 by League Staff in The Great AZ Road Trip | Tags: Arizona, Clarkdale, copper, educational, Historic, museum, tourism | permalink.